While the survival genre has been picking up steam over the years the majority of the time the experience is more purist and may have components of a story but that’s typically secondary to the survival aspects. 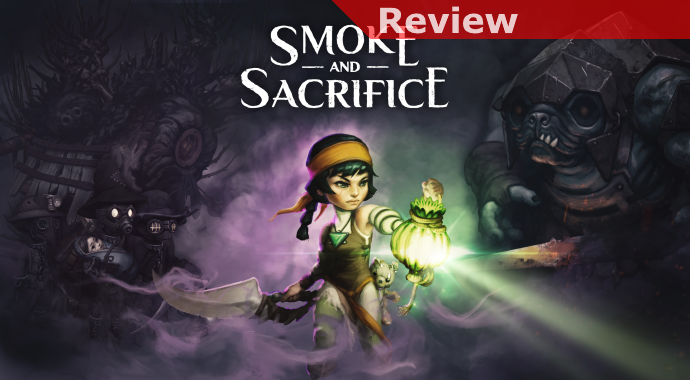 Turning the formula around a bit is Smoke and Sacrifice, a game that certainly has a serious survival element complete with crafting, resource scarcity, and some leaps of faith. However, here the experience is far more guided than what’s typical for the genre, with the narrative focus being on your character trying to find a child she’d assumed was lost 7 years ago. As you start out you’ll have very little time to orient yourself with what’s going on before you find yourself participating in your town’s traditional ceremony that demands parents sacrifice their first child to the gods in exchange for its survival in what seems like a difficulty environment. What agriculture you have is obviously sustained by the machinery all around providing light and likely heat since all around you is a frozen waste. You reluctantly go along, giving up your baby only to watch it be put on a platform and to watch it disappear, taken by the gods… or so you thought. 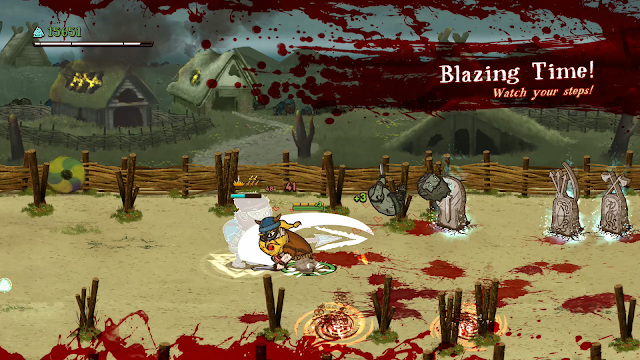 Years later chaos rips into your town with fires burning and creepy-looking, nasty pugbears about. With the help of a stranger you go to the altar you’d placed your baby on seven years before and find yourself transported to a hidden world beneath where you’d been living, the source of the energy that had sustained your village and apparently operated by the enslaved children who were supposedly sacrificed. Driven by that strong story as a base, your mother in search of her child will need to work diligently to overcome some formidable obstacles. Once nightfall comes you’ll need to have a lantern to help protect you from the harmful cloud of smoke everywhere. Exploration and gathering of materials is essential but as you move into new zones you’ll find that you’ll need special equipment if you want to survive. While you begin with some crude weapons you’ll need to discover ways to create more formidable ones, and even how to enhance them further. 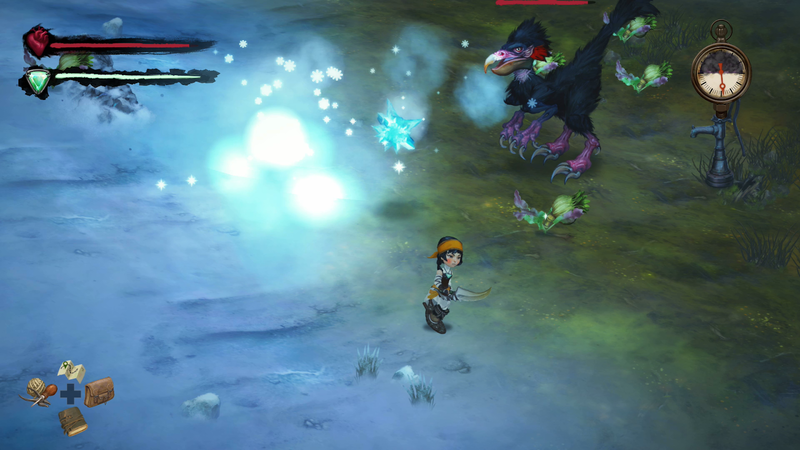 As you get further in you’ll have to continue to attack increasingly aggressive and dangerous creatures in order to cultivate the materials from them and to complete quests that are crucial to your progress. What you end up with is a full-on survival game that continues to be challenging, but that is still ultimately driven by a sense of heart as you try to learn the fate of your child and discover the dark secrets the priests had been hiding for so many years. Getting into the game’s issues definitely be aware that though the survival elements aren’t the primary focus they’re still a very active part of the game, and depending on your tastes it can get tedious at times. You’ll need to keep a pretty well constant eye on the condition of crucial items like your lantern, your net, your weapons, and even things like your shoes you’ll need to move through different environments. Expect to need to repair things often, need healing with some regularity, and to struggle as you get started to uncover some of the key recipes you’ll need to turn things around a bit. As this type of game goes I’d say the ongoing need to manage these more mundane details is pretty pronounced in the title, even if it mostly just requires keeping a stock of materials. The one way the game screws with you there is that many of those materials will degrade over time and if you don’t make use of them eventually disappear entirely. While it wasn’t a bit deal often there were a few times where this was grating as I would have to go back out and collect certain elements again. Finally, and possibly most critically, handheld play really isn’t ideal for the game. With your inventory levels and materials being so crucial the small-ish scale of these sorts of details on the Switch screen can make it tough for making out what you have or may be missing. What further exacerbates the issue is that in some zones the colors all blend together a bit too well and it can be hard not to do things like walk into swamps at times. The game otherwise playable but I’d definitely want to know roughly what I was doing before trying to play the game on the go because of these issues. In the end I really appreciate what Smoke and Sacrifice set out to do and how well it generally executed that vision. While survival games typically have played out, for me, as being merely for their own sake the added purpose behind your character’s survival being for the sake of finding the truth about the fate of her child I found compelling. Each step I’d take to get closer there would be more demands and the drive to overcome those obstacles felt much more personal than it typically does. While there’s some tedium, which is somewhat common to the genre, and handheld mode isn’t ideal it is still a compelling game that plays quite well. As the Switch has rolled along and its library has grown variety of choice has continued to improve. Rather than be focused on whether certain genres are represented we’ve now shifted into a space where you can find some nice variations in flavors within them. 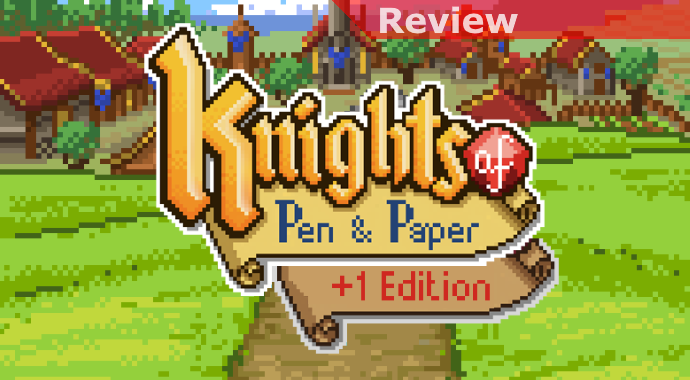 When it comes to turn-based RPGs the majority of them have been on the more traditional end of the spectrum, but Knights of Pen and Paper is looking to bust that up a bit. 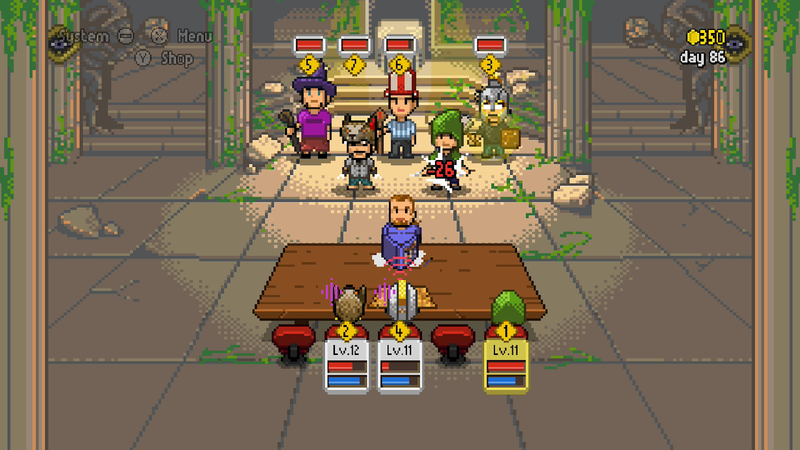 With a pretty lightweight battle system, a sense of humor, and a load of pop culture references hidden throughout it has its charms and should have an audience who’ll find it fun. Starting out on your quest you’ll need to begin by choosing the members of your party, and this is where it almost immediately does things a bit differently. Each character will need to have their archetype (jock, nerd, pizza guy, etc) and class assigned, with each archetype not only defining what buff or affinity for certain classes they have but also the sort of comments they’ll make as you make your way through the game. As you progress you’ll have an opportunity to fill all 5 seats at your gaming table and don’t worry, if you have someone who isn’t quite working for you there’s an option to drop them off at the pub to free up a spot for someone else. As you progress you’ll not only have choices for managing your party but also the environment you play in by buying furniture and even the dungeon master as well. 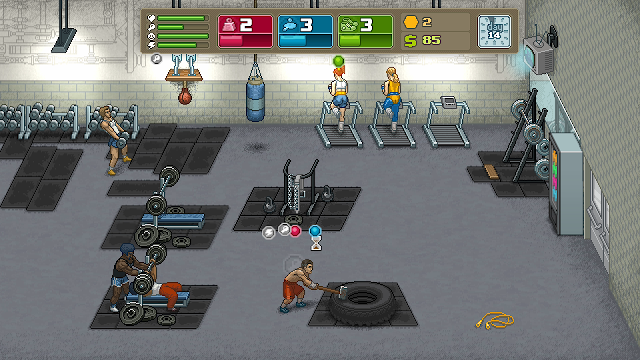 Of course, in order to make those improvements you’ll need to get out there and quest so you can earn gold. Moving from location to location you’ll have a variety of question choices presented to you, each with a rough indication of the appropriate character level. 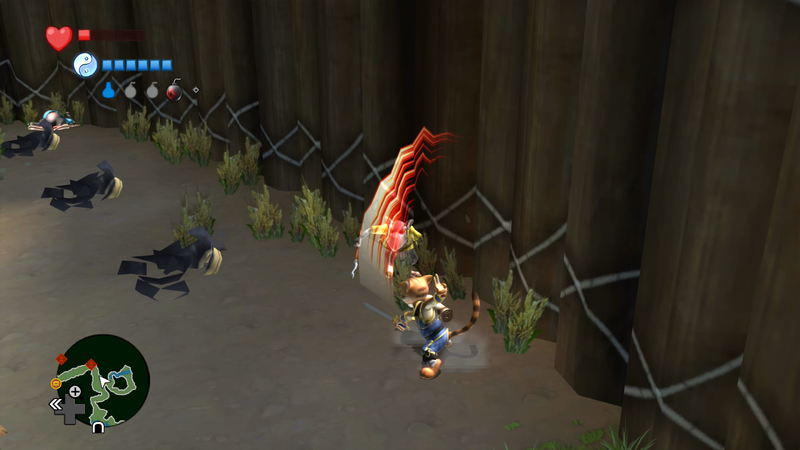 Combat isn’t terribly complex, you’ll have simple attacks as well as specials that consume some of your character’s mana. 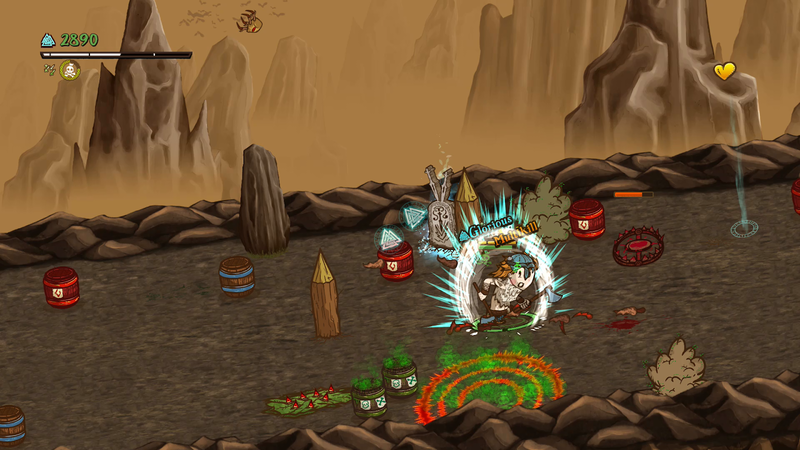 With each new level you’ll have an option to throw a point into one of up to 4 different spells or standing buffs, you’ll most likely want to concentrate on one or two in order to keep them from all being weak though. Once you’ve chosen your quest you may stay put, or it may require moving to another location, with a 20-sided dice roll determining whether you may be ambushed along the way. 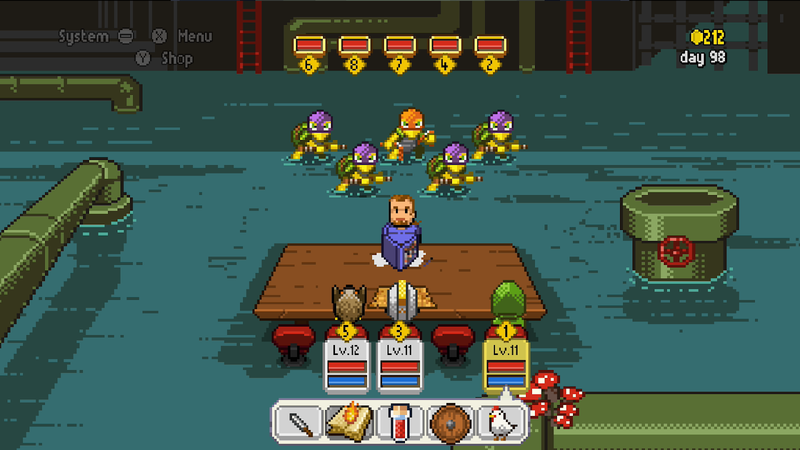 In general you’ll start out fighting the customary rats and bats but will slowly progress into battling with more interesting foes… like Teenage Mutant Ninja Turtles. It seems the dungeon masters in the game have a weakness for the pop culture of the 80s and 90s so if you grew up in those eras there’s a fair amount of fan service tapped to help elevate the fun. For the most part it’s this sense of fun and discovery that is meant to prop the game up, since having gone a less traditional route there’s not a compelling overarching story, your characters are intentionally simple and lack story arcs, and the combat system is pretty bare bones. What helps drive you is the desire to try out some of the fun choices for changing things up, find out what weird things you may be fighting next, and to explore new places to see what surprises there may be. That said, if this lighter style and lack of a meaty story aren’t what you typically would look for, or if the pop culture references don’t connect for you, what’s left is a pretty bare bones RPG experience beneath it all so it is vital you’re sure this is an experience for you. Local-mutliplayer-only games are a bit of a risk, even on the Switch. Relying on the availability of some friends, and with no way to enjoy the game solo, when the planets align and you have people available and willing to play the experience needs to deliver. In its real-world form hide and seek is certainly a classic kids’ game that can’t be enjoyed alone, can only be so good with a single friend, and gets better the more people you add. That makes it fitting that Invisiballs has been sort of billed as a next-gen hide and seek, it has the same limitations but can also be quite a lot of fun if you’ve got 4 people to play with. Visually the game is simple but has a somewhat futuristic look to it that reminds me most of a TRON lightcycle grid. The playfields will either be somewhat mazelike, have more open spaces, or some combination of both. Your characters really aren’t anything more than a dot typically, though when you attack it will leave a color trail. Since, for the most part, you’ll want to be incognito the majority of the the minimalist appearance makes sense. The hook in the game is that everyone is, at once, both a hider and a seeker. You can only move in straight lines until you hit a wall. At the point you make contact with the wall your colored dot will temporarily be visible. When in plain motion or sitting still you’re invisible though, and that’s where the strategies begin to form. For the most part the game is all about knowing where your opponents are and trying to deceive them about where you are when possible. You want to try to sneak up on them and then attack, if you hit them while you’re creating your lines you’ll score by taking them out. Of course your attack has a limited charge so you’ll need to be careful. The result is a game with quick bursts of intensity followed by a general sense of tension as people try to keep track of where people are and set up for the next attack. Aside from requiring other people (the more the better) to play there’s no doubt a limitation of the game is a lack of overall variety. Aside from the main deathmatch-ish Free For All mode there’s currently an alternative Gold Rush mode as well where a gold gem gets placed on the playfield and whoever gets it first then has to try to avoid getting hit for a set amount of time in order to score. This is a great alternative and changes things up in fun ways, somewhat driving to keep intensity up rather than everything being quite so cat and mouse. There’s a slot on the menu for an additional mode saying it is Coming Soon but until that’s in place you’ll only have those two options to work with. Overall I was surprised how positively my family reacted to Invisiballs. They’ve become pretty jaded with mutliplayer action games so when their initial skepticism melted away quickly to be replaced by whoops and yelling about who got who it was a sure sign the game was onto something. That said there’s also no getting around the limitation of really needing 4 people to be an optimum experience. 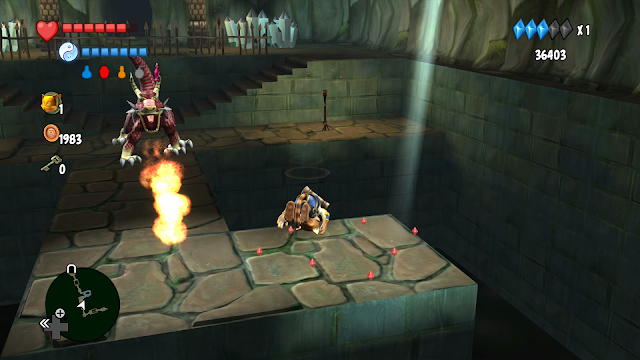 A 2 or 3-player match can be done but it is far more of a cat and mouse game followed by quick bursts of attacks until someone gets a kill. Only when you have a full roster do you have enough going on that you begin to see a wider variety of strategies in play and the game hitting its stride. A great option if you regularly have some friends or family around to play with though. While the Switch got off to a pretty slow start with side-scrolling brawlers / beat-em-ups we’ve now hit the point where there are a pretty fair number of quality options available. Defined by arcade classics like Double Dragon, Final Fight, and several other classic series the genre isn’t typically known for its depth but can be a lot of fun, especially if you’re able to play with some friends. 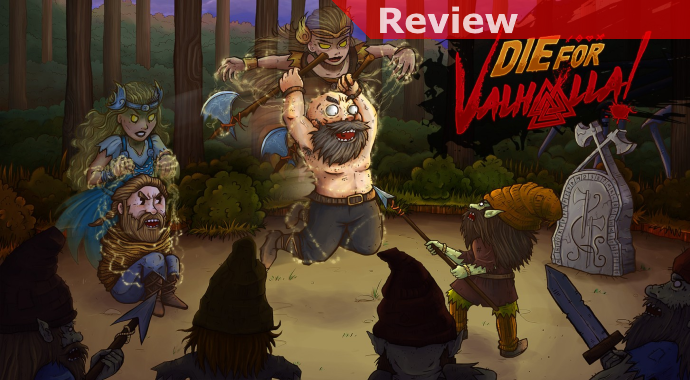 Die for Valhalla hits the Switch eShop lacking without too substantial a base challenge to it, but the inclusion of an option to play it in roguelike mode does at least add intrigue and help differentiate it among its peers. In the game you’ll take control of one of 4 Valkyrie (4 players is cool but the screen gets awfully busy) who have some base ability to attack but are generally very vulnerable in that form… the only one you can truly “die” in. In order to more safely and effectively attack your foes you’ll want to take possession of something. The traps and objects on the screen can all be possessed and have at least some minor beneficial effects, but for the most part you’ll be looking to resurrect fallen viking warriors. Each class plays quite a bit differently but on a general level you’ll have up-close-and-personal warriors, ranged warriors, and somewhat “crowd controllers”. As you play you’ll gain the ability to change your selection by aligning yourself with different clans, each with its own distinct combination of 3 warrior types. You’ll need to figure out how you want to play things, as inevitably once things get intense you may need to opt to go with another class by design or desperation, so the choice very much matters. In general the action is quite simple, you’ll have a basic attack, a special ability, a dash (that can have a weak attack), a block, jump attacks, and a charged special attack. There are some basic combos that you can get rolling with and the flow with each class is obviously quite different. In particular your special abilities (which have a simple gauge) vary between alternative attacks and stuns to things like setting traps or summoning NPC warriors to your side. 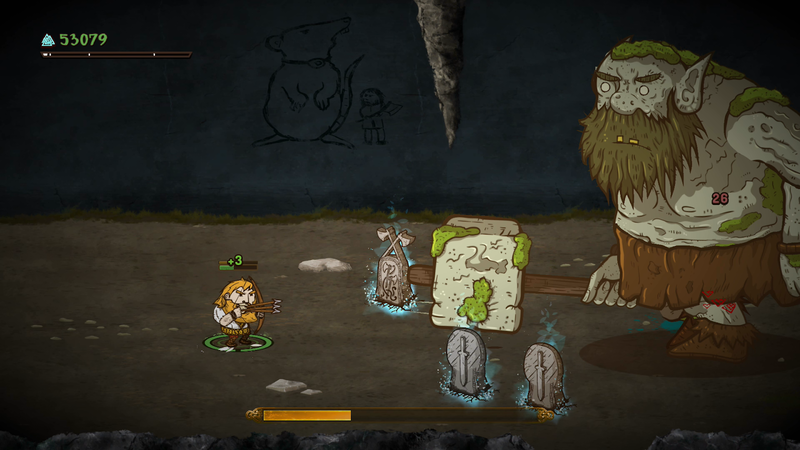 Throughout the game enemies will become more varied and formidable and you’ll need to be familiar with tactics to defeat them all if you want to survive. Each of your warriors starts out a bit weak but as you make kills and gain glory you’ll get stronger and more deadly. Between levels every time you gain enough experience to upgrade you’ll need to carefully consider your options as they will absolutely make drastic differences in how you play. Some abilities give you straight stats while others include healing on hit, doing damage when you collect glory, and many other variations. It is this diversity of potential enhancements you get to choose from randomly that help ensure that every run is a bit different. While you can certainly change up your abilities, your clans, and which classes you primarily roll with the game’s greatest weakness is that for the most part it is simply a good brawler but not necessarily much more. The difficulty does ramp up, and some of the boss fights can be a real grind as you’ll need to switch to different fallen heroes as the ones you’re controlling get chewed up, but for the most part it’s a very straightforward experience as opposed to something like Wulverblade which is far more diverse and demanding. In addition there are times when the game inexplicably stutters a little bit when a new wave of enemies are loading but it isn’t generally a big deal. All that that said, there small are touches like warriors being as likely female as male, that are appreciated and help change things up visually. When you stack that on top of the full selection of classes in the game, and then the clans that define which are available to you it does help add longevity even if you may be treading over the same general ground each time. The fact that you can opt to go roguelike is a nice one, but it also doesn’t change all that much. By far the biggest difference is the finality of your Valkyrie’s death so the tension ramps up quite a bit when your warriors fall. All in all I enjoyed playing Die for Valhalla for its relative simplicity that really does bring me back to the classic arcade quarter-pumping experience. Paired with some friends it can be a blast to simply maul your way through enemies and then fight for the glory that spews onto the screen at the end of each level. As long as you keep your expectations in check, and don’t count on it to deliver a very deep experience, it can be some good fun for at least a handful of hours of hacking up bad guys and bosses. Remasters of older games can be tough for a wide variety of reasons. There are certainly games from the past that deserve the treatment, and experiences that are either worth revisiting or bringing to a new generation of gamers. Where it can be tricky is when it comes to new expectations for behaviors and action for movement, combat, or even camera systems. 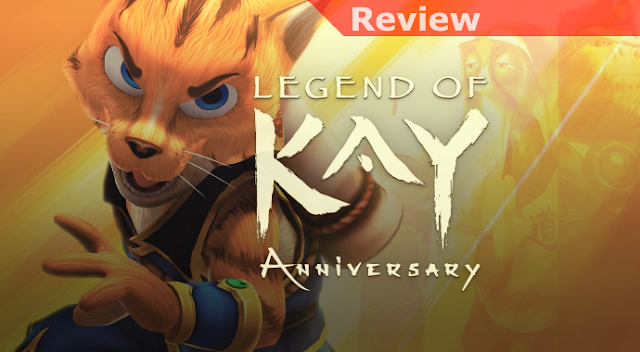 It’s issues like these, and a surprising one to do with the game’s voice acting, that make Legend of Kay Anniversary interesting to play through but also somewhat frustrating. 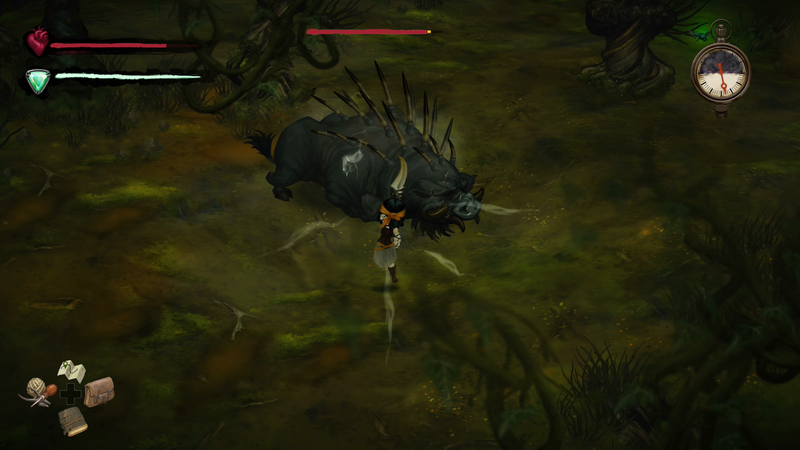 In the game you’ll control the young and talented Kay, who lives in a village of cats that has been beset by aggressive invaders in the forms rats and gorillas in particular. After a series of events further threatens his people and beloved dojo Kay decides to take what training he’s had to this point from his master and save everyone. To do so he’ll need to hone his skills, complete a variety of quests, take on progressively more formidable enemies, and always keep on the lookout for hidden goodies along the way. 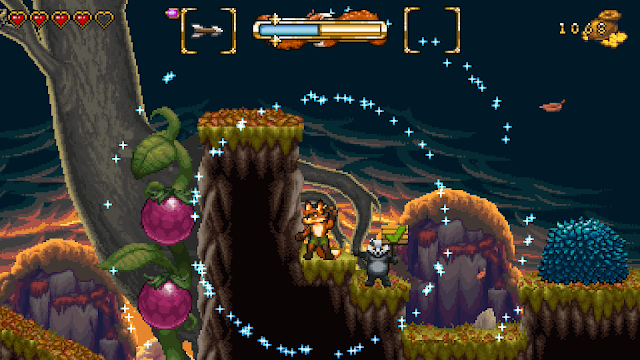 The two primary components of the game’s performance that are worth noting are the combat and the platforming, both of which have some issues. Starting with the combat it’s all relatively light and doesn’t take much to find what patterns of attacks work best for the various enemy types. 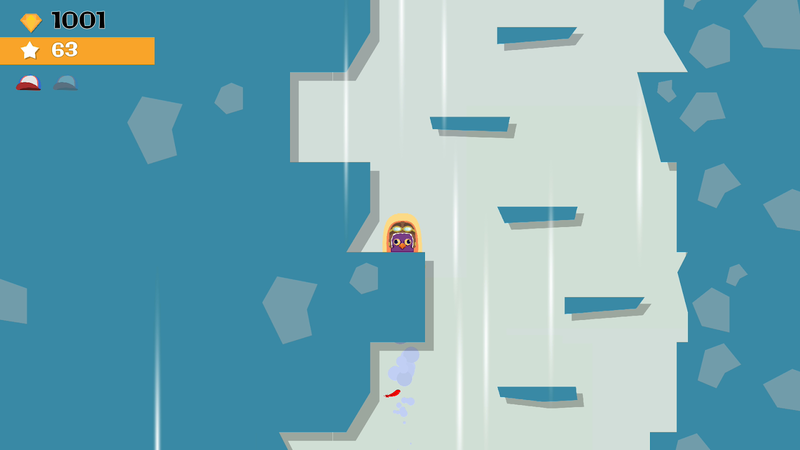 Platforming is varied and will have you making occasional tough leaps, doing some wall jumping, and grabbing ropes to move over gaps, among other things. Sometimes in open spaces this can all work pretty smoothly but there are other times when it can really be a chore. The thing that consistently holds back and complicates both is the temperamental camera. Aside from it feeling like it was set to turn in the opposite direction horizontally from most games I’ve played (thankfully you can invert this in the control menu) in tough spots you simply spend too much time trying to fight it to either get it into position or keep it there so you can see everything clearly. While it’s not a constant problem when it rears its head it can be seriously aggravating. While the combat tries to compensate for the chaos once you get a combo going by letting you hit X to simply go to the next enemy but unfortunately there’s no safety net for the platforming issues and this can result in falls that make you repeat some sections until you can work it out. While the game has had a general graphical overhaul that helps it look decent there are still some weird remnants of the original title’s age, the most prominent being the dead eyes and relatively simplistic animations when interacting with NPCs. Another area that hasn’t aged well at all, and that truly took me out of the game every time it came up is the voice acting. While you can usually evaluate in-game voice between great and laughable a significant number of characters instead veer off into the unexpected somewhat offensive Asian cultural caricature territory instead. I’m not sure what the rationale was behind this originally, or why this wasn’t addressed as it went through the remastering process, but it’s there and it can be a bit grating. I can understand the desire for characters to sound distinct from one another, and I applaud some of the efforts to emote to punch up the dialogue, but I got to the point where I simply left up the subtitles and turned the volume down to keep it from making me shake my head. Depending on what you’re looking for Legend of Kay Anniversary could be worthwhile. If you played it in its original form and have a touch of nostaglia for it or you’re simply a big fan of 3D platformers, even ones that haven’t necessarily mechanically ages well it has its strengths. That’s not to say there’s not some baggage along for the ride though, with the voice acting being a surprise out of left field. Be sure to check out some video of gameplay and read up further on it to be sure it’s a good fit for you. At times, even as much as I enjoy playing a wide variety of games, it does tend to feel like so many titles end up retreading familiar territory. That is one of the reasons I’m such a big fan of indie developers, since they tend to be a little more daring and willing to take chances on new ideas or combinations of gameplay that haven’t been experimented with before. One such combination of ideas is central to Yoku’s Island Express, which deftly mixes pinball with an adventure game. The result, though somewhat encumbered by the challenges with the pinball elements at times, is a charming, colorful, and thoroughly engaging experience. In the game you’ll play as Yoku, and industrious little beetle who is pushing around a ball (let’s not discuss what this may then be) and who is charged a bit randomly with being the island’s new postmaster. In order to do this you’ll get your first checkpoint on the island map and immediately you’ll begin to get the idea that this is a big place. Of course, even just this first step will require that you complete a few quests along the way, and possibly get sidetracked a bit trying to track down treasure chests and some collectibles. Even as you progress and the full scope of what you need to try to do to help the island’s inhabitants becomes known you’ll find that secrets and goodies seem to be lurking everywhere, and that can either make for a ton of fun or some frustration depending on your approach. 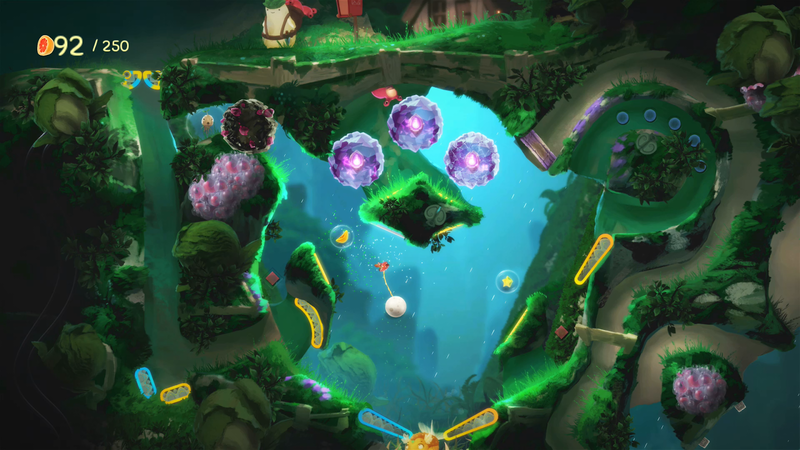 In general, everything you need to accomplish is some riff on classic pinball mechanics. You’ll have flippers, bumpers, targets you can light up, and a pretty wide variety of surprises… including some clever boss battles. 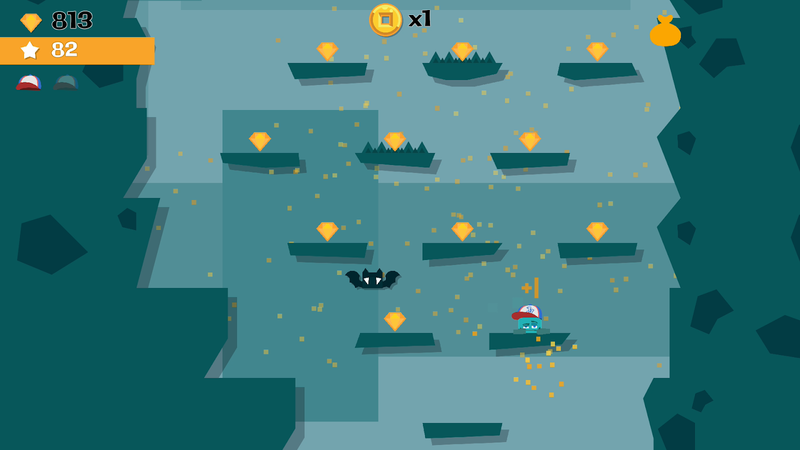 For the most part you’ll be rewarded in fruit for your efforts along the way, which act as the game’s currency and will allow you to either unlock special flippers that will allow you to go to new places, activate stations along the island Beeline fast travel system, or occasionally to purchase special things like maps that show where secrets on the island are hidden. 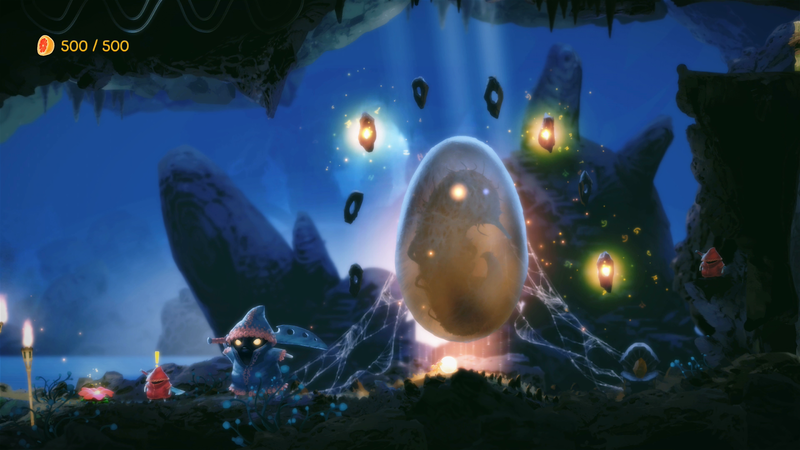 When you’re trying to get through the game’s primary quest, tracking down each of the 3 island Elders, you’ll also acquire special items and abilities that will give you the power to do things like use special flowers essentially as grappling points or to be able to swim underwater. As you gain each new ability you’ll then tend to remember spots on the island where those would help you get to something new so, in particular, if you’re a completionist you can plan on backtracking through many areas a number of times to try to scour for every possible secret, and there are many. Probably the greatest issue in the game, especially bearing in mind that there are quite a number of areas that you’ll need to move through more than once, is that traversal can be a chore at times. The first issue is that it can be hard to know where you need to go at times. Hitting the map can be helpful to show you active points you want to get to but even when you know where you want to go, figuring out how best to get there can be the next challenge. With so many routes that noodle around through the map it isn’t always obvious which combination of places you can go will get you somewhere. Later in the game the Beeline travel system can be extremely helpful for minimizing this problem but earlier on in the game it can be aggravating. This is mostly because of the last issue, and that’s the need to still execute some of the sequences and shots to get yourself into the right spot. Some way that would kick in an auto-trigger system or a simple bypass would have been nice in these sorts of moments since they’re obviously no longer fresh and fun when you’ve already done them. 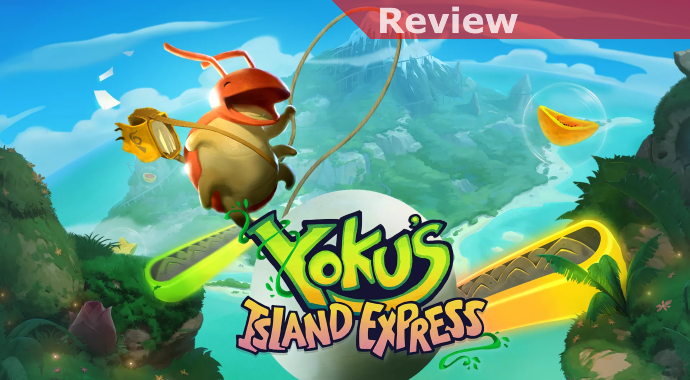 All said, Yoku’s Island Express is a breath of fresh and creative air on the Switch and just what this jaded gamer needed to get out of a pretty serious “more of the same” funk. As a life-long fan of pinball I’m thrilled with the result and enjoyed the many ways mechanical concepts from physical machines managed to get integrated into this adventure-style format. Even if you’re more of a pinball novice, in general the controls are pretty friendly and approachable, you’ll just need to develop a sense of timing and pay attention to certain patterns to determine what you’ll need to do to progress. If you’re down for something with boatloads of charm and heart mixed with a style of play you’ve likely never experienced before it is well worth picking up. 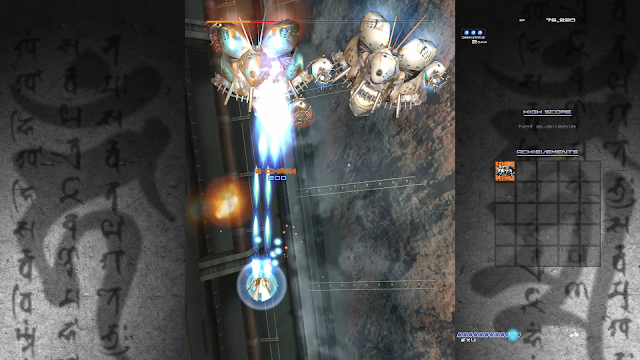 The shoot-em-up (shmup) / bullet-hell shooter genre is a tough one to evaluate when it comes to scoring. Overall, it’s a pretty niche genre for a reason, and that’s because the tougher you make it the more its fans are pleased but the less accessible it then becomes. Probably more than any other game in the genre I’ve played on the Switch Ikaruga is the poster child for this fact. It’s absolutely a shmup fan dream, providing surprisingly involved and complex gameplay, but that also makes me question whether more mainstream gamers will be able to enjoy it much. 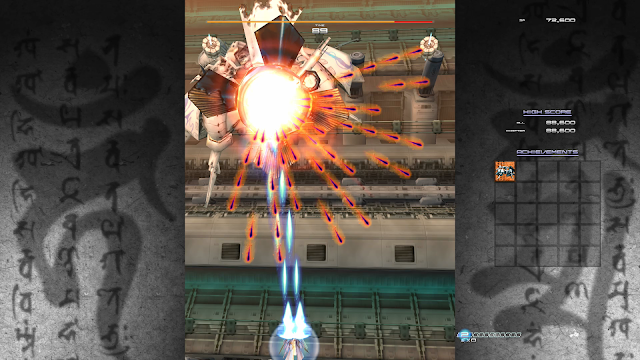 In Ikaruga you’ll take command of a ship that you’ll try to fly through waves of enemies of varying shapes and sizes, trying to evade their fire. While this describes pretty well every shmup in existence one critical difference is that there will be ships can be either white or black. Depending on which they are they’ll fire different colored beams and bullets at you. Where the complexity comes in is that you’re able to change the color / polarity of your ship as well, between white and black. Quickly you’ll discover that which color you are will dictate first what you’ll have to dodge, since enemy fire that matches your polarity won’t harm you. In addition, any enemy craft you hit with your firepower that doesn’t match their polarity will do double the damage. The final piece of the puzzle involving switching of polarities is that your combo multiplier for scoring only continues to increase as long as you keep destroying ships of the same color, so chasing high scores to the fullest can actually mean trying to selectively destroy what the game throws at you. To say this all drastically alters the way you play the game would be an understatement. The aforementioned would be tough enough but across the game’s 5 levels the level of difficulty ramps up significantly with every new stage. 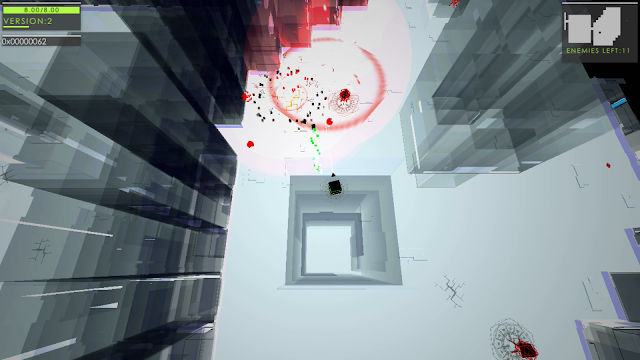 While the first is pretty standard, with a lot of enemies, it’s also generally in open areas. From the second stage on you’ll find yourself trying to deal with both enemy fighters and environmental complications of various kinds as well. Expect to be thrown into the meat grinder, asked to avoid the walls in narrow spaces all while trying to additionally manage your polarity to avoid being destroyed. It gets intense. To attempt to make things a little bit more accessible you do have some options at least. While Easy difficulty is certainly only a relative term you can go into settings and give yourself unlimited continues if you really want to see everything, just expect to die quite a lot. In terms of visuals note that this is a vertically-oriented shooter so you’ll either have bars on the sides or you can opt to rotate the screen if you have something to prop your system up and experience it the way it was truly meant to be. The ability to play with a friend is nice but given the utter chaos on the screen every second under normal conditions calling coop more insane would be an understatement. 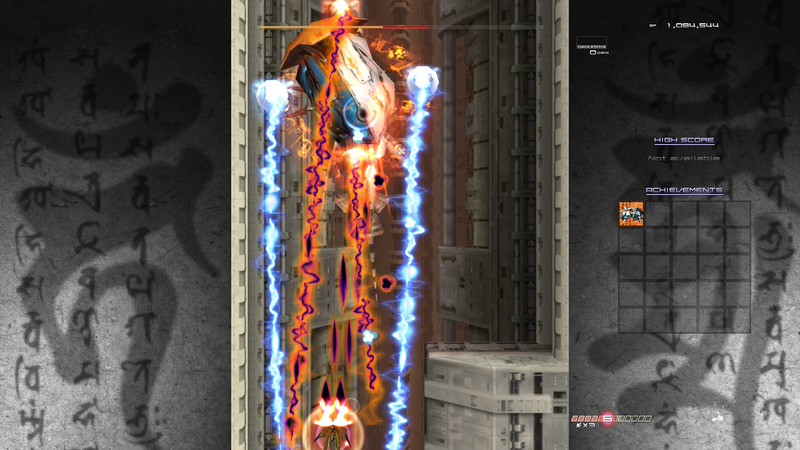 There’s almost as high a degree of memorization to Ikaruga as skill as you can only improvise your way through challenges like this so much. True success will only come from having familiarity with where to go, what to do, and then almost a degree of muscle memory to help you perform ballet between bullets flying everywhere. 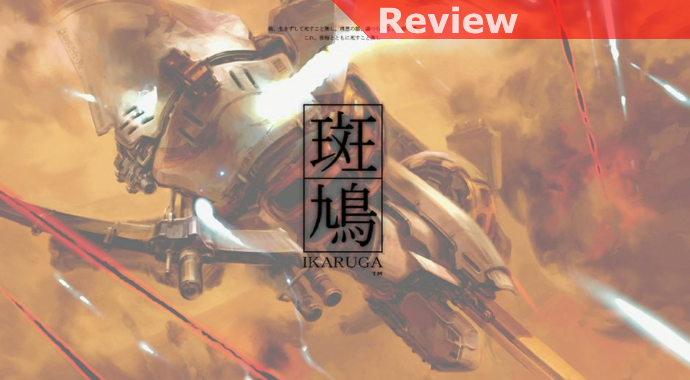 If you’ve been looking for a game that’s somewhat light on total content but that compensates with a demand for approaching perfection Ikaruga is as tough as they come. But, if you were hoping for something a bit more light and fun you can absolutely pass, this is a game that revels in its brutality. While the Switch has turned out to be a system far better suited to full and intense gaming experiences than many assumed its portability can still make it a terrific option for lighter fare as well. Mobile ports do tend to take a bit of a beating in terms of opinions but ones that are at least executed pretty well and engaging can still give them some merit for quick on-the-go gaming. 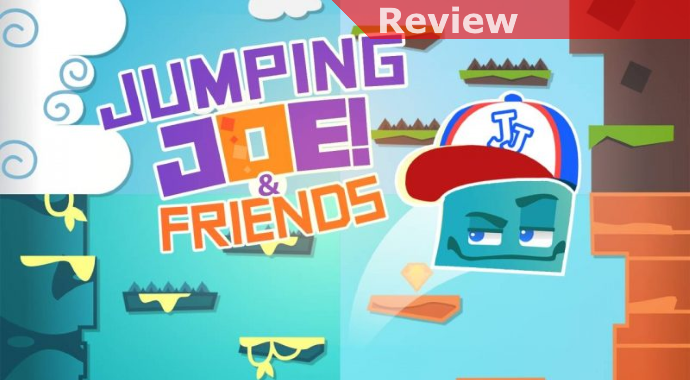 An example of this is Jumping Joe & Friends, a title that has come over from the mobile space but that can be good for some quick play, but that has also added on a simple multiplayer mode to help it be competitive as well. 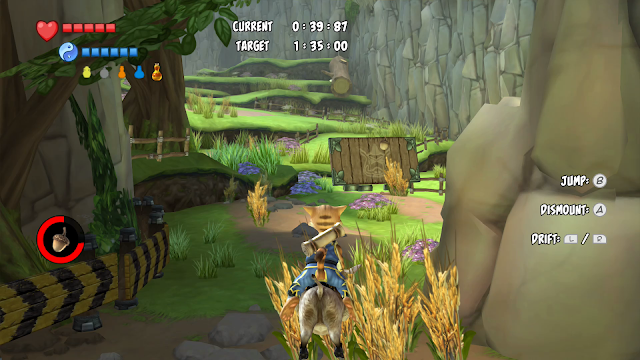 The object in the game is pretty simple, you just want to jump right or left to go up platforms, slowly taking you higher and into more challenging zones. If there’s nothing to that side or you’re trying to make a lateral jump to a platform on the same level you’ll fall and the game is over. As you make your way up you’ll want to be on the lookout for gems, gem bags (which temporarily put gems on all platforms you see), and a handful of power-up crates. By far the one you’ll likely want to be on the lookout for is the rocket power-up which will boost you further into the level. In order to make it a bit more complicated as you get to new zones (every 100 platforms) you’ll have new threats to deal with. There can be spikes, bats, crushing walls… you’ll need to begin to more carefully try to plan your route and use some patience as you’ll often need to pause and get your window of timing correct to make it through unscathed. Of course you’re never able to pause for long as there is lava that will start to catch up to you quickly if you take too long so constant upward movement is a priority. Each game will award you gems that you can then use to unlock new characters, upgrade characters, or even unlock new modes. Of course if you’re fast and adventurous enough the better way to unlock the new modes is to complete the specified objectives for each but for one you’ll need to get to the 300 marker within 60 seconds (I suggest going with the bird and upgrading his rocket boosts, which helps a great deal) and then the 600 marker for the other, which is no small feat. You’ll be able to play against up to 3 friends as well if you’d like, seeing who can get up the quickest, though keep in mind that with the relatively simplistic nature of the gameplay this probably won’t be very diverting for long. 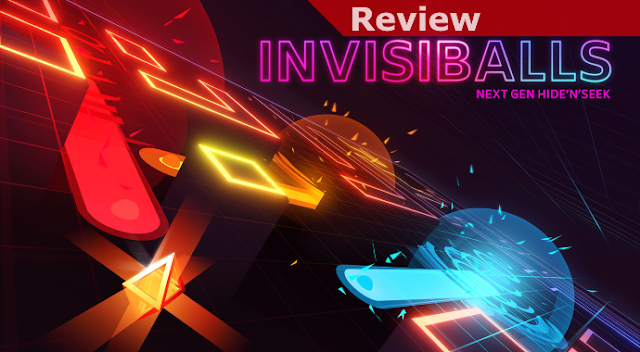 All in all this isn’t a bad game to play for a little while but it also does little to distract you from its overall bare bones simplicity which would feel more at home on a mobile phone than on a Switch. I suppose for quick and easy family fun for all ages the very simple nature of the game would make it well matched for multiplayer fun with younger players, but even for less experienced players it’s hard not to see how the thin veneer of excitement would eventually wear through to seeing the very repetitive nature of the experience for what it is. As long as you’re going in with your eyes open, and aware of the extent of what it is bringing to the table, it’s not a bad way to kill some time. 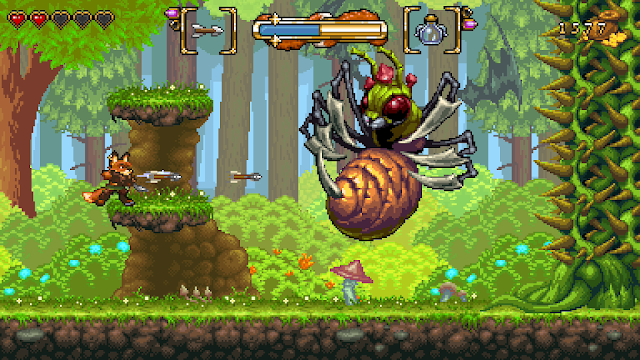 A central component of many indie game releases has been a return to pixel graphics in classic 8-bit and 16-bit styles. Not only is doing this cost-effective, it also celebrates the amazing level of detail and beauty that were possible. A benefit is that modern systems can display graphics in this style but with more layering, enemies, and detail than were practical at the time so their full potential can also be realized. Where Fox N Forests takes things to the next level is in delivering a play experience that’s very reminiscent of the SNES and Genesis era, celebrating not just the classic look but feel as well, making it a great throwback experience across the board. Charged with the Season Tree to collect seeds and restore the forest you’ll start out with a simple crossbow, a double-jump-and some basic slashing moves. 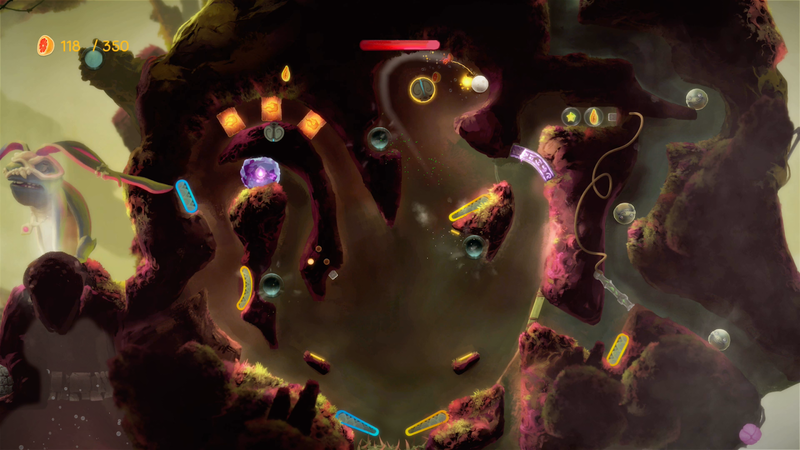 In order to progress you’ll need to make your way through a variety of enemies as well as work out environmental puzzles that often require you to make use of your power to temporarily change the season. Depending on the stage and the alternative season for that level this will have a variety of effects from freezing the waters, to growing fruit and making leaves fall that you can use as platforms, and more. After you complete the 2 stages that accompany each season you’ll then face off against a boss that will test your skills and require you make use of your abilities as well to defeat them. With each boss defeated you’ll gain new enhancements to your crossbow, which will not only make you more formidable but also enable you to reveal hidden platforms and areas you weren’t able to access before. 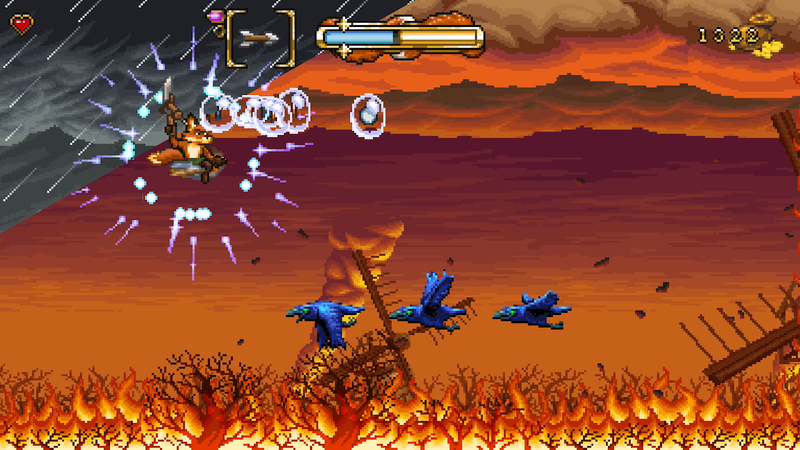 Most of the game’s levels involve platforming, whether moving mostly horizontally or sometimes vertically (with a notable side-scrolling shooter level thrown in as well), needing to carefully avoid or dispatch enemies, keep an eye out for a variety of environmental tricks and traps, and search out signs of secret areas… something there’s an abundance of in the game. Most of these will have chests in them to allow you to gain some good you can use for upgrades but some have other objects that you’ll need to get certain more select equipment. By the time you’ve gotten into the third season or so you should be pretty well equipped and generally far more formidable than you were at the start, picking up a spinning attack off your double jump, a hard group stomp attack, and more. The progression is satisfying as levels you’d once had to be a bit more cautious in you’ll be far more confident making your way through, scouring for secrets you’d missed. If there’s a criticism of the game the greatest one would likely be the somewhat mandatory repetition of levels you’ve visited before. While you won’t need all 5 hidden seeds in each level to progress (once you get all 5 in a season you unlock a special hidden level for each) you will need a certain number of seeds to unlock each season and at some point to get enough you’ll be forced to backtrack to reveal hidden areas you simply didn’t have the equipment to reveal before. For the most part the difficulty isn’t too overwhelming, and 3 skill levels are offered, but be aware that if some of your skills are lacking even on Easy there’s an expectation that you’ll be able to get through specific sequences and losing less health when you’re hit doesn’t make some sections any less difficulty if you struggle with certain types of platforming challenges. 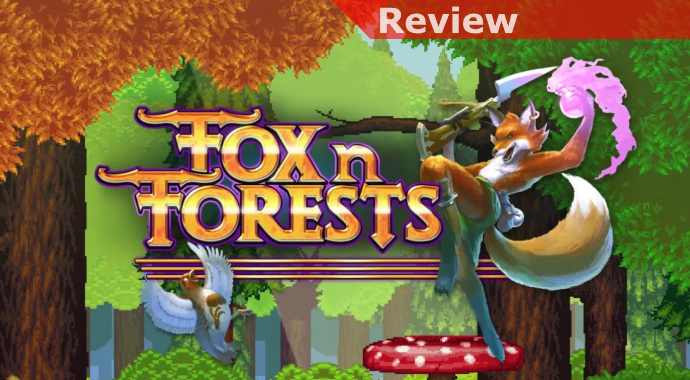 Overall, Fox N Forests truly feels like a lost game from the the Early 90s that you could plug into your SNES and it would seem right at home on all levels. Of course for people who aren’t looking for that hit of nostalgia or are generally unfamiliar with that era this may not be a great fit. However, if you’ve been itching for something satisfies your sense of nostalgia and can dig in to the total experience it’s a welcome reminder of how beautiful pixel art games can be. 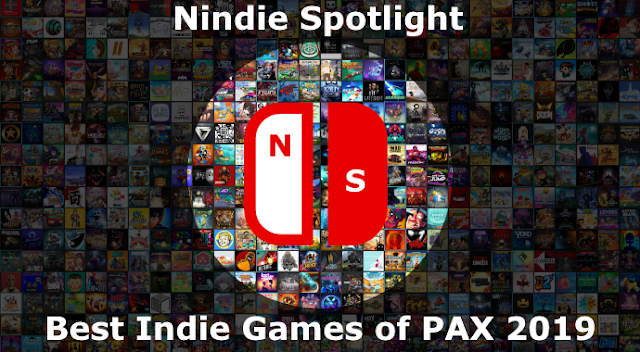 An inevitability of the success of the Switch, specifically in terms of how well many indie games have done on the platform, is that we’re seeing a lot of games that have been around get ported over. While there’s nothing wrong with this, and for people who simply have missed the games to this point it can still be great, some ports feel like a more natural match and make great use of the system and others simply come over as they are. 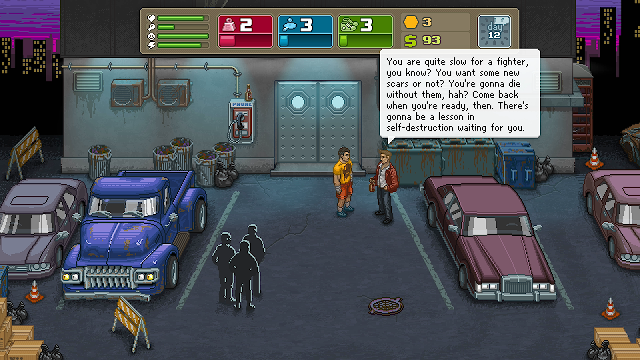 Punch Club is one such game, a hybrid of RPG and time management elements blended with a boxing/vigilante hero theme. 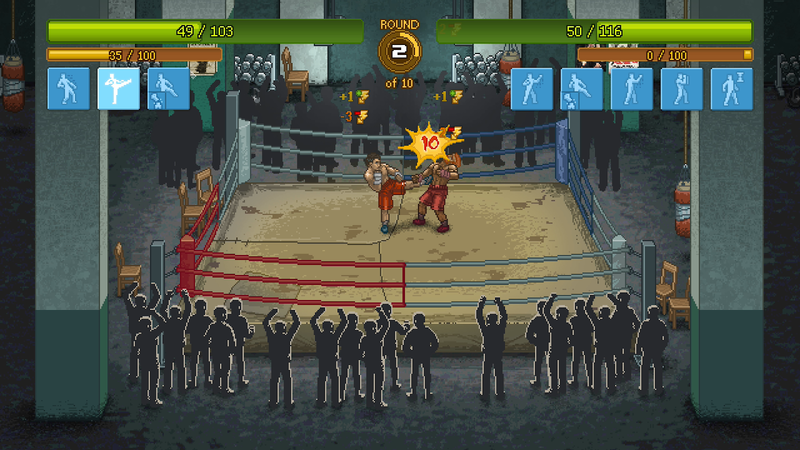 In the game you’ll take on the role of the son of a slain boxer who is somewhat destined to follow in his father’s footsteps. Or something like that. For the most part the story is a loose construction of boxing/fighting tropes, pop culture references of all sorts, and a somewhat weird sense of humor. Considering the game’s age some of these references have begun to feel a bit dated but at least I wouldn’t say any of it is necessarily cringeworthy. The humor and oddness of it all tends to be a part of the hook though and at least some of the included nods made me laugh a little. The meat and potatoes of the gameplay is a bit more indirect than most would probably assume or be used to, as you don’t actually control the fights directly, you instead train before fights, trying to get your guy in shape, and then you’ll dictate what core moves he’ll use in the fight, always trying to work the best you can with the training areas you’ve focused in the most. There’s actually a bit more to this than there would appear to be on paper, especially as you move along and get to higher levels. There’s a real art in maintaining a bank balance through doing jobs, staying well rested, training optimally, and then delivering yourself in the best possible shape to each fight. Your opportunity to tune you current skills can also make all the difference between rounds as well. In particular keeping an eye on your energy and that of your opponent will make or break you in the tougher fights. If you use expensive skills or fail to properly counter the right attacks your energy will deplete and you’ll eventually begin to get knocked down, losing quite a bit of health in the process. This can absolutely turn the tide in a fight that, to that point, looked headed in the other direction. 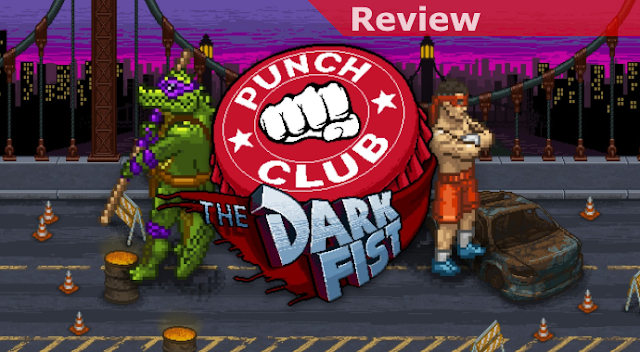 While there’s nothing particularly wrong with Punch Club, as a whole, it’s also a game that has been around for awhile and is showing some signs of its age. First, the action is, for the most part, a bit limited as it has been on both handhelds and smartphones. Everything is played out in a pretty limited way and nothing in pushing the power of the system at this point. Next, you absolutely should be sure you’re coming into the game with the proper expectation. This is in no way a “boxing game”, which would imply there are arcade-like skill-based sequences of some kind. It is, instead, a time and resource management game first and foremost, and the bulk of your time will be spent trying to ensure you’re making progress but also have a roof over your head and food to eat. Once you lock into a solid routine it can then get a bit more rote but fights always have a degree of challenge to them as you ponder as they start whether your fighter is really up to the test. Fight results will vary from a razor thin margin to an all-out blowout, depending on how well you train, so never give up and try to pick a style and skills that suit your preferences so that everything is in alignment. 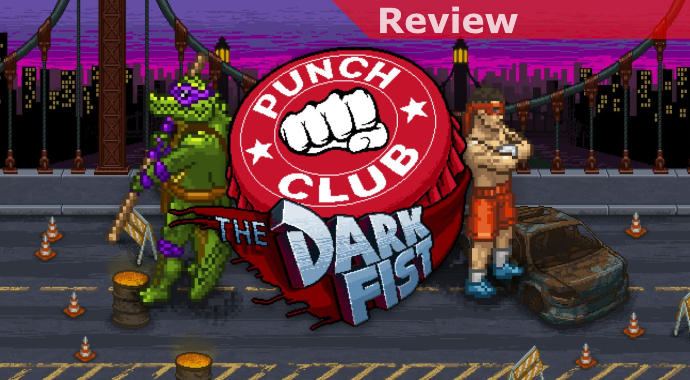 While Punch Club isn’t a bad experience by any means there’s no way to get around its limitations. If you enjoy its somewhat relaxed “play it on the cough while you watch TV” style and haven’t already indulged in it by all means give it a look. If you’ve dabbled before or are looking for something action-oriented it likely won’t be worth considering though. 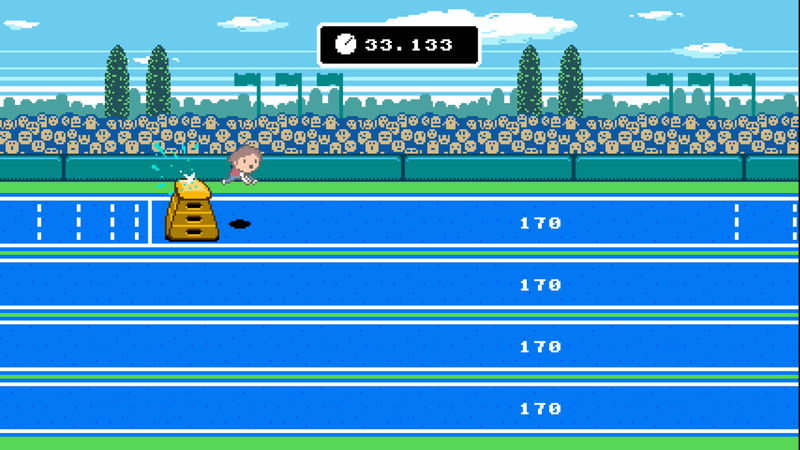 While, in general, the multiplayer Olympic event style game hasn’t been popular or very successful in quite a long time it is one of the genres that really takes me back to some great times. Both in the arcade with Track N Field (as well as HyperSports) and at home with the classic Epyx Summer Games series I played the hell out of these multi-event titles. 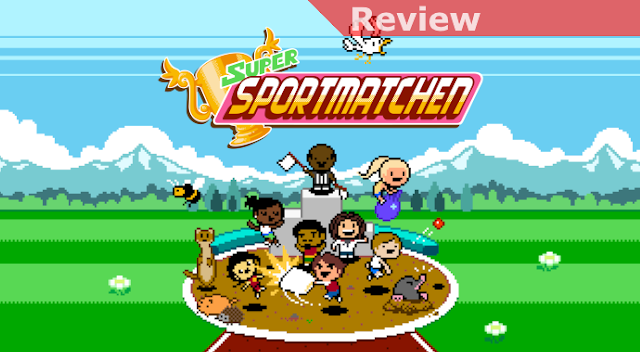 Everyone would have their favorite events, as well as ones they’d struggle with, but in general they provided a challenging but fun bit of variety among sports titles that were often a bit more repetitive. With that in mind seeing a title like Super Sportsmatchen, and perhaps even more vitally hearing it, really put me into a good place mentally. An early surprise is even against games of that earlier time the presentation and options are surprisingly thin, with very few countries represented with characters you can choose from. A bit odd, but it is hardly a major sticking point. Your options are to play through a set of 5 of the game’s 10 events or a marathon of all of them. 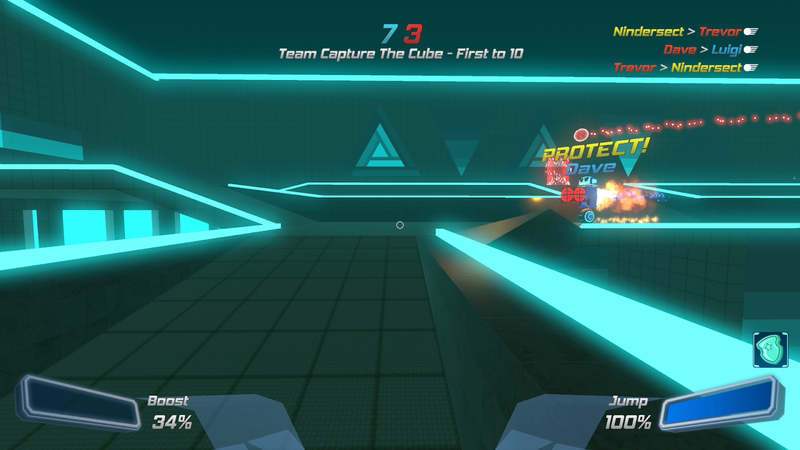 You can play with up to 4 people total, whether with friends or with AI bots, and you even have an option to team up or go it solo. If playing alone I’d definitely recommend just playing through on your own initially to get a feel for everything just to save some time. 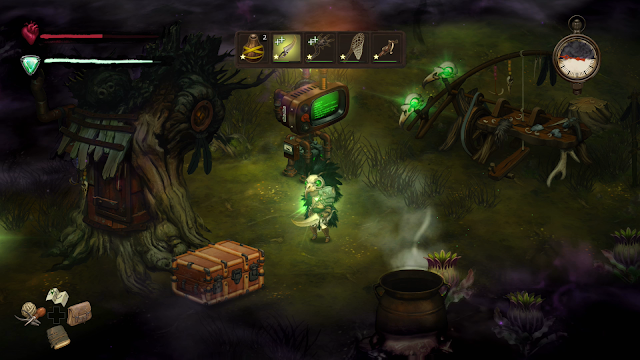 The first oddity, though this is also part of the game’s charm, is the selection of events. These include relatively straightforward and expected events like running a sprint and basketball, but then deviate into weirdness with pillow fighting and animal feeding on the other end of the spectrum. Then there are some events like rock climbing and kayak racing somewhere in the middle. In general, the way to control your athlete for each event is roughly spelled out before things begin, though certainly having any level of skill or mastery with them takes some time even if nothing is terribly complex. You’ll play through the events, get your event scores, and then see your overall ranking as you reach the end. What struck me with some of the events are some of the design choices in terms of controls. Where simplicity has generally been a key component to success in these sorts of games, with controls anyone could likely have some success with quickly but take time to master, there are some events in the game that feel unnecessarily hard. In particular the norm of running events being a product of trying to mash a “left” and “right” button to get your speed going has a layer of complexity thrown in with you needing to alternate or you’ll stumble. Absolute accuracy in the animal feeding “shooting” event also feel a bit like overkill. It’s small things, though at least everyone is dealing with the same issues, but on top of the oddity of some of the events this does make the game a little less simply approachable from a pick-up-and-play perspective with some friends. 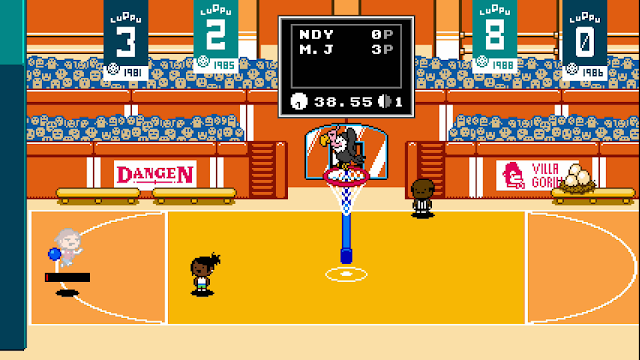 Of course, if you’re not playing with friends this also makes the AI athletes complete bastards since they’re pretty well unimpeded by anything and will probably mop the floor with you for awhile. The best way to play this game is with a group of friends who are all roughly starting out from the same level of familiarity. As everyone struggles with the controls equally the bar is pretty fair and the quirkiness of some of the events will no doubt get people laughing. As each person incrementally gets better at events that suit them I don’t doubt the game could continue to entertain and challenge. However, if you’re not playing with friends aside from chasing world records for their own sake playing against the AI probably won’t feel very rewarding since in some events the lack of being encumbered by physical controls is very clear. Somewhat similarly, if you’ve got some time under your belt and start to play it with friends who are new to the game you’ll likely have a pretty unfair advantage for a while because of the nuances and quirks with the control in some events. I love the game’s spirit but the implementation in key areas makes it tricky to recommend without caveats. 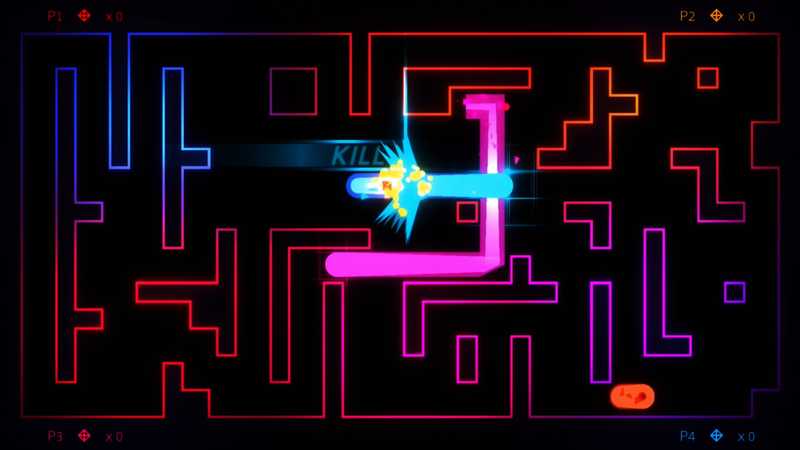 If you’ve been following my reviews for a while you may have picked up that I’m a bit of an old-school arcade gamer with a weakness for a good twin-stick shooter. Whether it is the more bare bones and basic type or ones that get something procedurally-generated going I’m usually down for some fun. 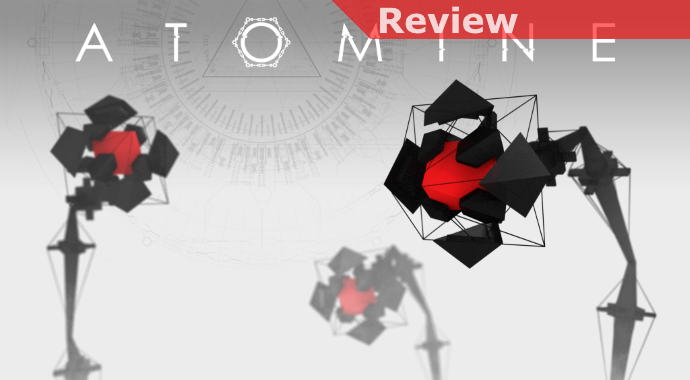 Atomine is a bit of an interesting mix of the old and new-school twin-stick shooting cool in one, with procedurally-generated levels, some challenging bosses, and a very distinctive yet sparse visual style. In the game you’re roughly in the role of a computer virus that’s looking to infiltrate a computer system, hacking through layers of security. The aesthetics are pretty interesting, though at times the camera angles and on-screen glitches (though they can be turned off that sort of sterilizes the game too much) can get to be a bit much. The thing is, for the most part they work and they help distinguish this from pretty well everything else on the console. As you progress and get in deeper you’ll begin to unlock improved enhancements, weapons, and even base configurations to start from. In general the challenge is pretty substantial and it took awhile for me to unlock enough and get into a groove with a configuration that worked well for me. In the normal spirit of it being a roguelike the weapon enhancements, for the most part, are a give and take proposition. Increase your range and you’ll typically lose some frequency, split your fire into multiple shots and they’ll get weaker. It is really a balancing act and I found myself trying a variety of configurations out with different base weapons before I found my ideal mix, which typically involved a single powerful laser beam, but there’s a case to be made for some other weapon combinations as well no doubt. Energy that represents your health tends to be a premium as you move on in levels so enhancement opportunities that improve the drop rate or rate it replenishes you are often a key to long-term success. In terms of criticisms the typical issue with roguelikes does rear its head in the sense that you’ll need to invest some time struggling to get to the point where you’re feeling like you’ve got a fighting chance. A somewhat typical indie flaw can also be aggravating early and that’s the fact that pretty well nothing is explained at all so you’ll need to work through some initial trial-and-error experimentation just to be sure what all can damage you, what different enhancements mean, etc. All things considered at the price it is asking I wouldn’t say it’s a tremendous sticking point, just be warned. 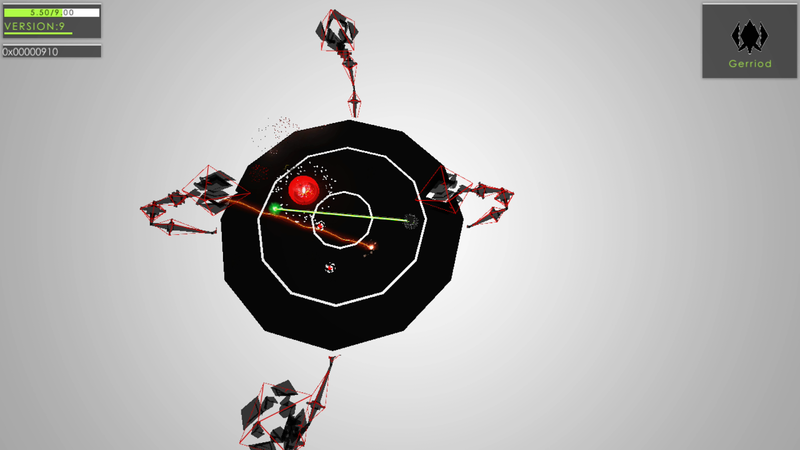 If you’re a die hard twin-stick shooting fan Atomine is a bit of a breath of fresh air among the offerings already available. Its more arcade-like sensibilities make it a bit more friendly to pick up and play and the runs tend to be on the quicker side, though if you get rolling it can take a bit. More mainstream gamers who’re in search of a shooter to check out may find there are better examples of the genre on the Switch but could find the relative simplicity of it all appealing, especially in handheld more where its more chunky look works well on the smaller screen. 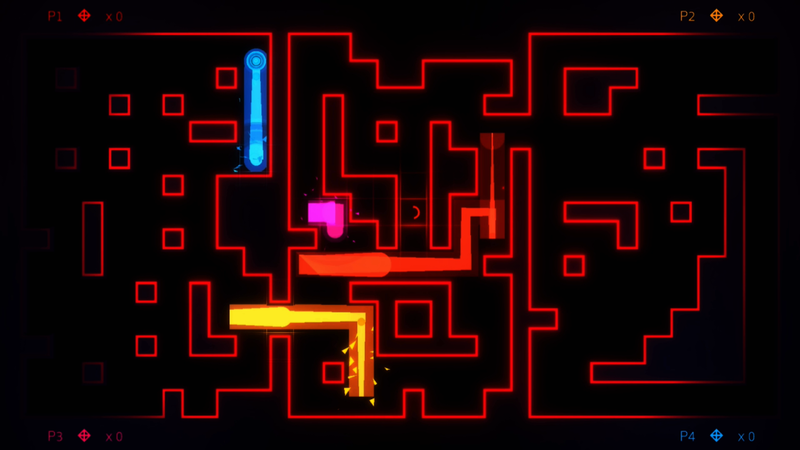 If you’re looking for a very cyberpunk-looking twin-stick experience it is worth a look. Online first-person shooters have obviously been around for quite some time now and will continue to be popular forever most likely. What’s great is when someone takes the basics of that experience and begins to play with it a bit. In particular I’ve always been a huge fan of team-based experiences that became more popular, offering up a bit more than standard deathmatch. Going in a bit of a different direction, but still fundamentally having that core shooter experience at its heart, is Disco Dodgeball Remix… and for the right crowd it can be a pretty fun time. Sporting a pretty wide array of arenas with colorful lights everywhere in many ways the environments remind me a bit of playing laser tag. 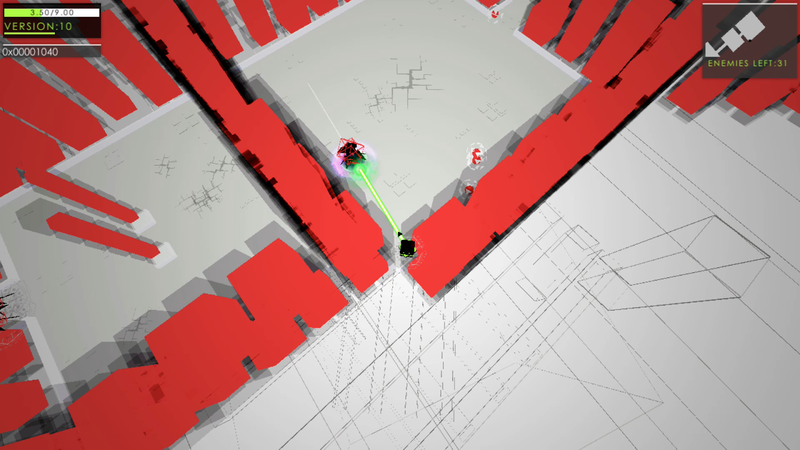 You have a great mix of wide open spaces, ramps, some corridors, and plenty of angles for ricochets. This sets the stage for some fun and unpredictability, and that’s what really defines the core of the game’s experience. 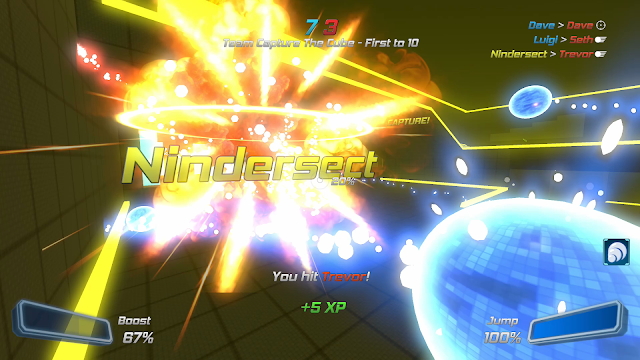 Once you manage to grab a ball you’ll be able to charge up, take aim, and try to nail one of your opponents. Mobility is a bit more limited than I’m accustomed to, your jump being on a charge takes a bit of getting used to and in some ways makes it tough to use but overall your boost tends to temporarily speed up seems more useful anyway. A small variety of power-ups are strewn about, though only about half of them did I find to be of much use. 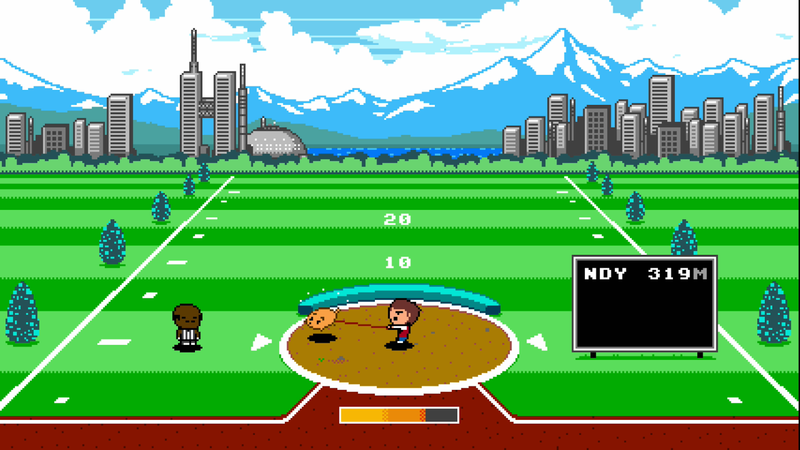 If you’re really feeling daring you can try to catch an incoming ball, which does knock out the person who threw it, but in the heat of things that’s definitely tricky. In order to get your bearings before trying to go online I’d recommend starting with either the Arcade Mode or simply playing a Bot Match to get a feel for things. 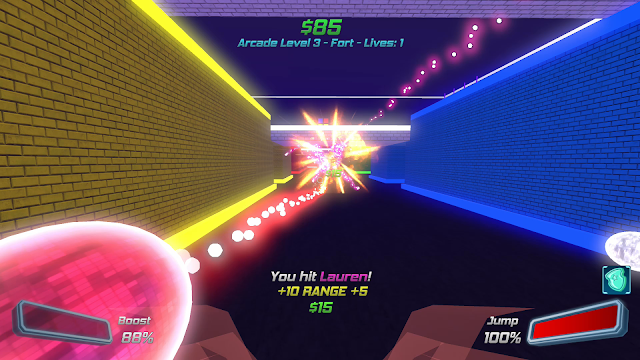 In Arcade mode you’ll face off against a steadily-increasing number of opponents and then a slightly souped-up boss of some sort. You’ll accumulate money you can then use on some upgrades between rounds to tune up your play and in general this is a good starting point for developing technique and getting some unlocks that will help you customize your character a bit. Your multiplayer options are 2-player local (which does work but lacks the excitement the chaos of many players brings) and then Online Multiplayer, the great thing being that by default the 8 players in matches will be filled by bots who, if anything, can be too good. With a pretty wide variety of team-based modes ranging from traditional to silly I found just enjoying the chaos of it all to be refreshing. Capture the flag, straight team deathmatch, variants where specific players are the target, the diversity of modes really helps keep things interesting and fully chaotic and that’s when the game is at its best. Of course there’s no getting around some of the rougher edges, mainly that the controls definitely take getting used to and are on the floaty/imprecise side. Most of this is felt in movement but if you’ve been playing a lot of Splatoon 2 comparing aiming in the 2 games is also pretty night and day. Thankfully everyone is on the same playing field in this regard, so nobody gets an edge, but at times the bots can be a bit aggravating with their ability to make shots that feel improbable. I’d say that while the crafting system is nice in theory, with your earning a special random crate periodically with something in it to enhance your character, in a game like this I don’t know if most people will have the longevity in it to really get a combination they’re happy with. A simpler system where at least items you craft yourself could be chosen may have been better to help people get customized and more connected with their character more quickly. 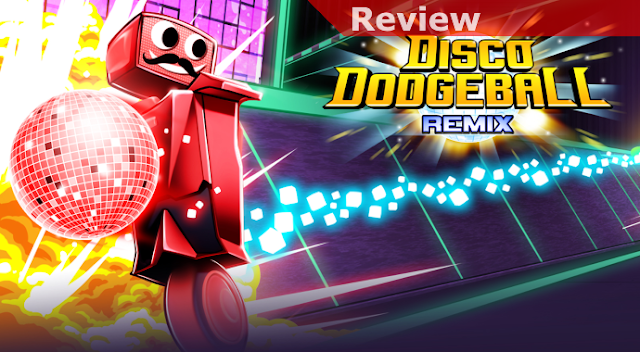 In the end Disco Dodgeball Remix is unapologetically what it is, for you to take it or leave it, and I respect that. In terms of total content and options for play both alone, with a friend, or online the game is absolutely stacked. Exhausting the Arcade and various Challenge modes will take time for people who enjoy chasing leaderboards and with so many varied arenas and play modes online matches are generally surprising and crazy. 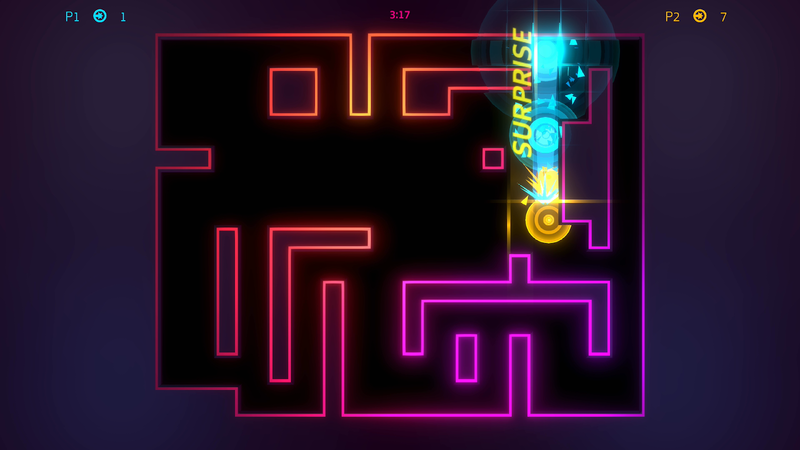 There’s no getting around its quirks, and if you’re expecting pinpoint precision control you’ll be disappointed, but if you’re up for some chaotic play that’s very unique Remix has its charms.